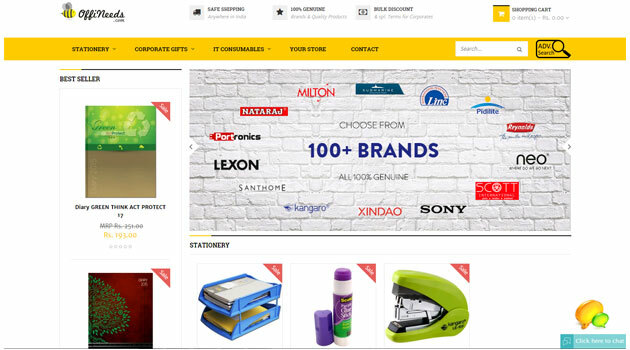 Bangalore-based Ravi Agencies Pvt Ltd, a distributor and manufacturer of office stationery products, has merged with Touchstone Enterprise Pvt Ltd, the company behind online corporate gifting portal GiftWrapped.in, to co-create a B2B online office supply store Offineeds.com. The new site will be operational from March 6, 2015. As per the deal, both the companies will shut down their existing operations in about three months to fully focus on OffiNeeds.com. The co-founders of both the firms including Ravi Agencies' Ravi and Nanjunda Shankar and Gift Wrapped's Srikanth Acharya and Srinath Setty will be a part of the board of the company. The founders have pooled together a seed capital of about Rs 1.5 crore to set up the platform, they said. "I believe this merger comes straight out of the textbook. Both companies have very complimenting skill sets and yet very similar values and ambitions," said Nanjunda Shankar, founder, Ravi Agencies who will now be the COO of OffiNeeds. The company will offer products under four categories including stationery, IT consumables, housekeeping materials and corporate gifts. The target customers are entrepreneurs/business owners, purchase managers in large corporates and educational institutions. Ravi Agencies was founded in 1957 Ravi and Nanjunda Shankar's father Ashwathanarayana as a paper trading company and later went on to become distributor and manufacturer of stationery items like pen, paper, colours, calculator, files, envelopes etc. Gift Wrapped was founded about a decade ago by software developer Acharya and finance professional Srinath Setty and specialises in the corporate gifting category. It has branches in Bangalore, Hyderabad, Chennai, Mumbai and Delhi and catered to large to medium corporates. It would compete with the likes of Kobster, which recently raised funding besides others like iThinkStore.com and Rocket Internet-backed Hank Retail Pvt Ltd, the company that owns and operates OfficeYes.com, a B2B site for office supplies & stationery, among others. Offineeds.com Ravi Agencies Pvt. Ltd. Touchstone Enterprise Pvt. Ltd.